I was a waiter once, back in the day. 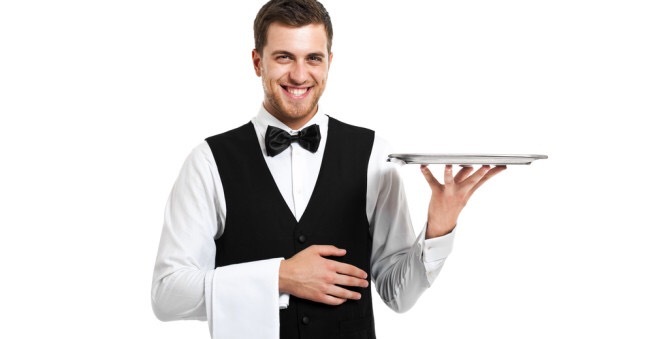 I feel a certain kinship with waiters, and always give them the benefit of the doubt. But when I’m by myself in a restaurant, please . . . just leave me alone to read my book and eat my dinner in peace. Sure, it might just be the milk of human kindness– or it might be a desire for a tip. But every time I eat alone these days, the wait staff annoyingly gloms on to me, asking what I’m reading and making irritating chitchat when I ‘m just trying to read and eat my dinner. It makes the dinner intensely irksome. I don’t want to hear what waiter X has to say — I just want to read my book. Here’s a tip for the wait staff. Sometimes, at least, the solitary diner with a book isn’t lonely and craving your company. They just want to read. Leave us alone, already! Yesterday I went to lunch with a group of friends. Shortly after we sat down we all realized, with a groan, that we had been cursed with an overly intrusive waiter. It wasn’t difficult to reach that conclusion. He would hang around our table, clearly eavesdropping on our conversation, and then offer his extended and thoroughly unwelcome comments about whatever we were discussing — be it music, or weddings, or whether the restaurant in question would be a good place for a first date. After the third or fourth such incident, I felt like checking under the table or looking behind nearby chairs to confirm that the waiter wasn’t lurking nearby, ready to spring up and offer another lame joke or awkward self-reference. I’m sure he thought his trenchant observations and amusing anecdotes culled from the rich tapestry of his life were adding immeasurably to the enjoyment of our meal. We, on the other hand, came to dread his presence and windy comments like the people of the Middle Ages came to dread the bubonic plague. I suppose there’s a well-mannered way to tell the overly intrusive waiter that he’s ruining the meal, but I don’t know how. So we all sat, listening politely as he talked, and talked, and talked, and hoped that our lack of affirmation or follow-up questions would send an obvious message that we weren’t interested in what he had to say. Unfortunately, the waiter utterly lacked the sensitivity to pick up on those signals. And every second we had to listen to the blatherings of this complete stranger cost us a second of each other’s company. I used to be a waiter and still admire those in the food-service industry, but there’s a line that shouldn’t be crossed. Waiters should be friendly, sure . . . but mostly they should be responsive and ready to serve. Tell us the daily specials, keep the drink glasses filled, take our orders, and bring us our food and, eventually, the check — but otherwise please leave us alone!